Stay Sharp and Focused All Season Long! Christmas is everyone’s favorite time and Reader’s Digest Ultimate Christmas Puzzles is the perfect gift. Take an hour, take a minute, or just crack open this copious compendium for a spur-of-the-moment teaser that will help you to stay focused and relaxed throughout the busy holiday season.This ultimate collection includes creative crosswords, Spot the Difference photos and illustrations, mind-bending quizzes, tricky word searches, challenging sudokus and mazes, as well as tons of fun brainteasers, festive trivia, word games, and so much more—all guaranteed to tone your brain while celebrating the holiday spirit. So have yourself the merriest Christmas ever and take the stress out of the holidays by relaxing with this fascinating collection of entertaining puzzles! 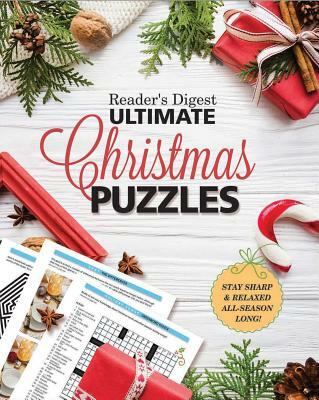 Reader’s Digest Ultimate Christmas Puzzles will provide you, your family and friends with hours of mind-stretching activities and laugh-out-loud fun to make the holiday season special!